A 16%-protein, fat-enhanced, pelleted ration designed to improve the deer’s body condition prior to and throughout the rut. The high energy content will replenish body condition of does and bucks during and following the rut and during periods of low forage availability and quality through the winter months. This superior nutrition will result in healthier animals prepared to grow big antlers and produce and feed large, healthy fawns. Formulated with patented AntlerMax Technology to promote superior antler growth in bucks next spring and summer, reproductive success and abundant milk production in does, and supports optimum growth and healthy development in fawns. Contains proprietary AntlerMax Mineral Technology, a power-packed nutritional package with ideal amounts and ratios of vitamins and minerals for superior antler density and strength, optimum reproductive performance and healthy fawns. 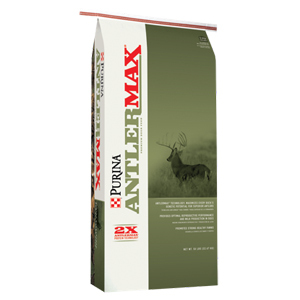 ANTLERMAX PELLETS - For the development of optimal antler size and mass. Provides for a high intake of high-quality proteins including AntlerMax® By-Pass Protein technology that deliver high concentrations of amino acids needed by the growing antler. Helps develop deer with exceptional body size. High-quality protein helps maintain muscle to support body growth. OPTIMUM LEVELS OF VITAMINS AND MINERALS - Helps promote antler growth, density and strength. Optimum levels of calcium, phosphorous, magnesium and vitamin D. Contains proprietary AntlerMax® Mineral Technology including organic trace minerals for replenishing depleted bone material stores used during antler mineralization. HIGH FAT CONTENT - 3.0% fat from several high quality vegetable oil sources that help deliver a high percent of fat directly to the growing tissues. Helps deer regain body condition quickly. SUPPLEMENTS POOR OR SPARSE FORAGE - So deer can maintain vigor during periods of environmental nutritional stress HIGH PALATABILITY - Enhanced with flavoring to attract deer to the feed so they receive the benefit of a balanced diet. ANTLERMAX® RUT & CONDITIONING DEER 16 FEED is a researched 16% protein, high-energy ration. Specifically formulated for what free range deer require to support overall health, reproductive performance and antler growth.